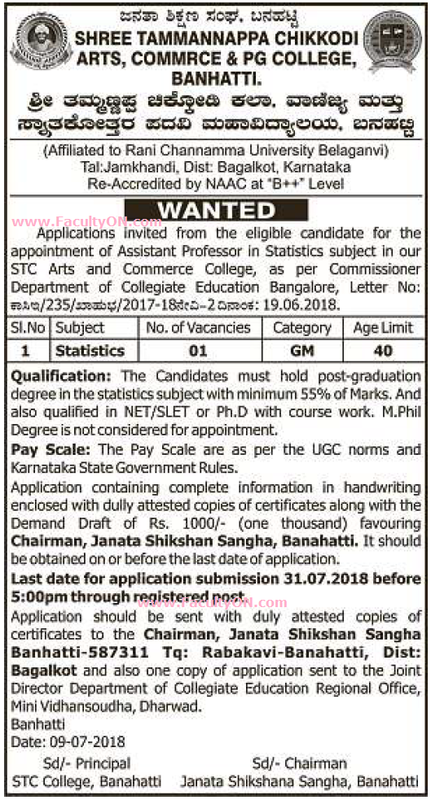 Shree Tammannappa Chikkodi Arts Commerce & PG College, Banhatti in the DECCAN HERALD newspaper has advertised in the newspaper for recruitment of Assistant Professor jobs vacancies. Interested and eligible job aspirants are requested to apply on or before 31st July 2018. Check out further more details below. Application Fee: Rs.1000/- as DD favouring The Chairman, Janata Shikshan Sangha, Banhatti. It should be obtained on or before the last of application. How to Apply: Interested and eligible candidates are requested to send bio-data along wit attested copies of certificates / testimonials and recent passport size photos to the postal address provided below.